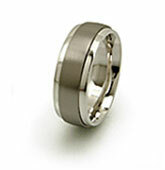 Titanium is one of the most durable, stylish and modern looking metals available to craft fine jewelry. 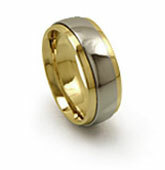 It is known because it is more durable than virtually any of the other precious metals (such as gold, platinum or silver), but it looks just as beautiful and sleek. Titanium is used to make things like jet plane parts, which are absolutely required to be durable and non-breakable. 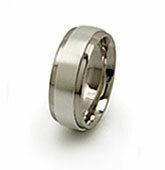 It does not bend, deform or stain, so your wedding band or engagement ring will look just as beautiful in fifty years as the day you got it. 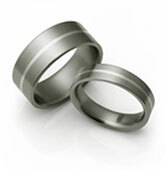 The variety of ring styles and sizes you can get in titanium is just as wide-ranging as with other metals. 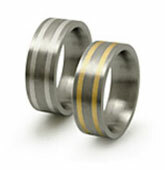 Titanium rings can be made with inlaid silver, gold or platinum for an especially luxurious look. The inlays are sturdy, going in at least one third of the total ring depth. 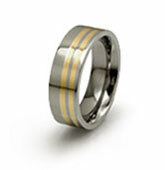 You can choose any size and inlay metal for a gorgeous one-of-a-kind wedding band. 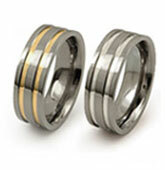 If tungsten is more your style, we also carry a wide variety of lovely tungsten rings available with ceramic, gold and platinum inlays. 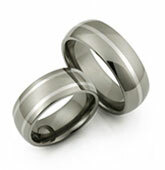 "Received my titanium ring this week. It was an engagement ring for my boyfriend, and he is absolutely delighted with it. I was also delighted with the service I have received from you. I was particularly impressed with the delivery tracking by email. 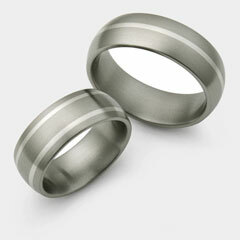 I will certainly be ordering our wedding rings from you in the next 8 months! Thanks again". OH MY GOD! 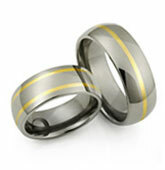 The rings are more beautiful than I thought they would be. 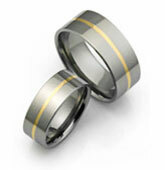 I ordered a set of inlaid titanium rings. It's exactly the different look I was hoping for. Everything is perfect!!! I even changed the type of the inlay after ordering and it was to me in no time. THANK YOU!